alaTest has collected and analyzed 17 reviews of John Lewis Fenix 3 Spotlight Ceiling Plate. The average rating for this product is 4.1/5, compared to an average rating of 4.7/5 for other products in the same category for all reviews. We analyzed user and expert ratings, product age and more factors. Compared to other products in the same category the John Lewis Fenix 3 Spotlight Ceiling Plate is awarded an overall alaScore™ of 80/100 = Very good quality. Looks good but the bulbs are a pain to change and, boy, do they need to be changed frequently! Ours currently has one bulb out of commission because the glass pulled out without the rest of it, now awaiting a pair of pliers. Issue is with the bulbs provided , 2 blown within 3 days , just waiting for the next to go . 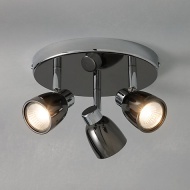 This light fixture does the trick. Colour is muted and blends well with the boy's bedroom it has been fitted in. Would recommend as an affordable spotlight plate. Smart, cool, does exactly what it says on the tin! Light is fine. However, bulb has gone after only 3 months and I can't work out how to remove it!